Located 30 km. southeast of La Paz is the picturesque village of Palca. The nearby canyon of the same name is 8 km. 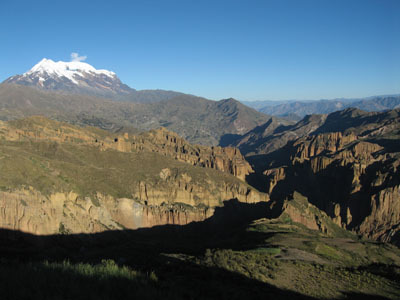 long beginning in the Abra de Ovejuyo (and ending in the town of Palca) and offers great views of snowcapped Illimani mountain. 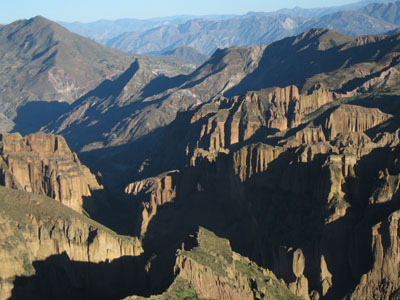 Here, interesting rock formations resemble gothic cathedrals and obelisks sculpted by water to a height of over 200 meters which leave at the bottom of the canyon a flat plain, a kind of avenue which goes 8 km. all the way throughout the canyon.